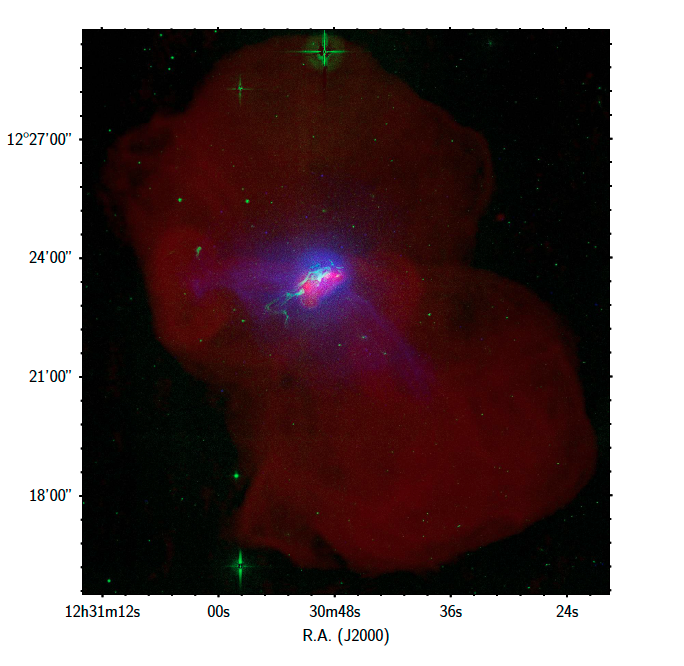 Difference in chemical composition between the stars 16 Cyg A and 16 Cyg B, versus the condensation temperature of the elements in the proto-planetary nebula. If the stars had identical chemical compositions then the difference (A-B) would be zero. The star 16 Cyg A is richer in all elements relative to star 16 Cyg B. In other words, star 16 Cyg B, the host star of a giant planet, is deficient in all chemical elements, especially in the refractory elements (those with high condensation temperatures and that form dust grains more easily), suggesting evidence of a rocky core in the giant planet 16 Cyg Bb. Credits: M. Tucci Maia, J. Meléndez, I. Ramírez. A team of Brazilian and American astronomers used CFHT observations of the system 16 Cygni to discover evidence of how giant planets like Jupiter form. One of the main models to form giant planets is called “core accretion”. 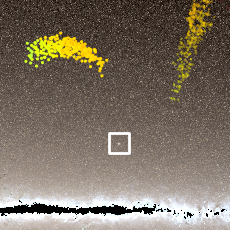 In this scenario, a rocky core forms first by aggregation of solid particles until it reaches a few Earth masses when it becomes massive enough to accrete a gaseous envelope. For the first time, astronomers have detected evidence of this rocky core, the first step in the formation of a giant planet like our own Jupiter. The astronomers used the Canada-France-Hawaii Telescope (CFHT) to analyze the starlight of the binary stars 16 Cygni A and 16 Cygni B. The system is a perfect laboratory to study the formation of giant planets because the stars were born together and are therefore very similar, and both resemble the Sun. However, observations during the last decades show that only one of the two stars, 16 Cygni B, hosts a giant planet which is about 2.4 times as massive as Jupiter. By decomposing the light from the two stars into their basic components and looking at the difference between the two stars, the astronomers were able to detect signatures left from the planet formation process on 16 Cygni B. The fingerprints detected by the astronomers are twofold. First, they found that the star 16 Cygni A is enhanced in all chemical elements relative to 16 Cygni B. This means that 16 Cygni B, the star that hosts a giant planet, is metal deficient. As both stars were born from the same natal cloud, they should have exactly the same chemical composition. However, planets and stars form at about the same time, hence the metals that are missing in 16 Cygni B (relative to 16 Cygni A) were probably removed from its protoplanetary disk to form its giant planet, so that the remaining material that was falling into 16 Cygni B in the final phases of its formation was deficient in those metals. The second fingerprint is that on top of an overall deficiency of all analyzed elements in 16 Cygni B, this star has a systematic deficiency in the refractory elements such as iron, aluminum, nickel, magnesium, scandium, and silicon. This is a remarkable discovery because the rocky core of a giant planet is expected to be rich in refractory elements. 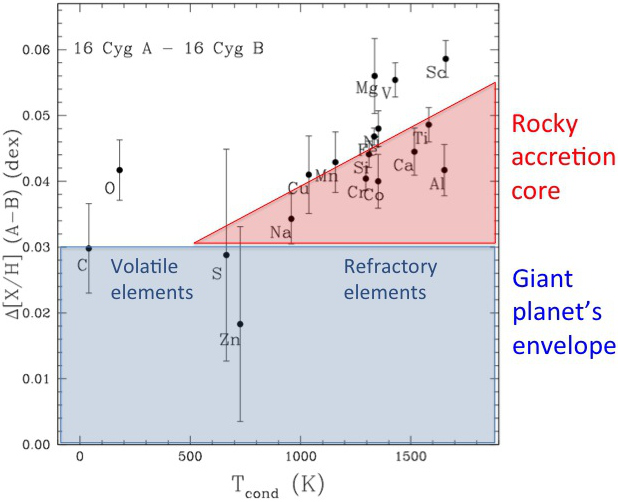 The formation of the rocky core seems to rob refractory material from the proto-planetary disk, so that the star 16 Cygni B ended up with a lower amount of refractories. This deficiency in the refractory elements can be explained by the formation of a rocky core with a mass of about 1.5 – 6 Earth masses, which is similar to the estimate of Jupiter's core. "Our results show that the formation of giant planets, as well as terrestrial planets like our own Earth, leaves subtle signatures in stellar atmospheres", says Marcelo Tucci Maia (Universidade de São Paulo), the lead author of the paper. "It is fascinating that our differential technique can measure these subtle differences in chemical abundances; we achieve a precision that was unthinkable until now", adds team member Jorge Meléndez (Universidade de São Paulo). Ivan Ramírez (University of Texas) concludes: "16 Cyg is a remarkable system, but certainly not unique. It is special because it is nearby; however, there are many other binary stars with twin components on which this experiment could be performed. This could help us find planet-host stars in binaries in a much more straightforward manner compared to all other planet-finding techniques we have available today." The team is composed of the PhD student Marcelo Tucci Maia, Prof. Dr. Jorge Meléndez (Universidade de São Paulo) and Dr. Iván Ramírez (University of Texas at Austin). This research will appear in the paper “High precision abundances in the 16 Cyg binary system: a signature of the rocky core in the giant planet”, by M. Tucci Maia, J. Meléndez and I. Ramírez, in the Astrophysical Journal Letters.